Almost immediately after premiering the footage at this year's MTV Movie Awards, Warner Bros dropped the footage online for all to see. The results are spectacular, as the first extensive trailer for Fantastic Beasts and Where To Find Them looks like an episode of Boardwalk Empire crossed with the Harry Potter franchise, and mixed in with a little bit of King Kong. We mention that last influence, because if the film lives up to its title, those New York cops are looking up at something so massive, it's going to take more than a muggle-friendly suitcase to contain it. In Fantastic Beasts and Where to Find Them, Eddie Redmayne plays Newt Scamander, a writer who has penned the book on which the title of this new movie is based. We don’t know a ton about the plot, mainly because there was no plot to the Harry Potter companion piece. It was a guide to magical creatures that were found throughout J.K. Rowling’s fictional world. This, however, creates a lot of room for improvisation, and the movie seems to be taking advantage of that. With Fantastic Beasts and Where To Find Them, the politics of the wizarding world look to be coming into focus yet again, starting with Eddie Redmayne's Newt being expelled from Hogwarts, despite an endorsement from Albus Dumbledore himself. 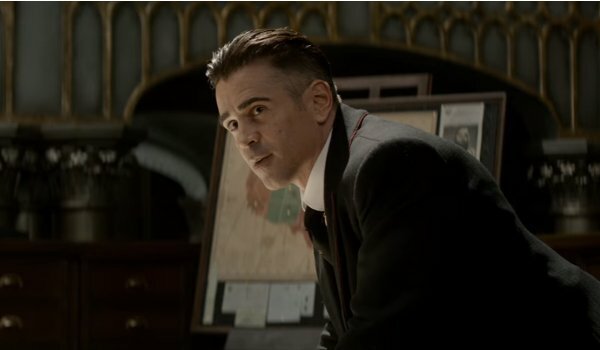 Soon enough, he's wrapped up in a tangled plot we're just getting a taste of, involving witch hunts, magical elected officials, and Newt Scamander's would-be pursuer, Percival Graves – played by Colin Farrell. Longtime Harry Potter director David Yates will helm Fantastic Beasts and Where to Find Them, which co-stars Redmayne, Katherine Waterston, Alison Sudol, Dan Fogler, Ezra Miller, Samantha Morton, Jenn Murray and Colin Farrell. It will be in theaters on November 18.